Rabbi Natan Slifkin, with a black-and-white ruffed lemur. Natan Slifkin also Nosson Slifkin (Hebrew: נתן סליפקין‎; born 25 June 1975 in Manchester, England), popularly known as the "Zoo Rabbi", is a British-born Israeli Orthodox rabbi (non-pulpit serving) and director of the Biblical Museum of Natural History in Beit Shemesh, Israel. He is best known for his interest in zoology, science and for his books on these topics, which are controversial to Haredi Jews. Slifkin was born and raised in Manchester, United Kingdom, where he studied at a local yeshiva. He left in 1995 to continue his studies in the Medrash Shmuel yeshiva and Mir Yeshiva in Jerusalem, Israel. He was ordained at Ohr Somayach Institutions, where he taught Talmud and contemporary Judaism. He now lives with his family in Ramat Beit Shemesh, where he runs the Biblical Museum of Natural History. Slifkin has a master's degree in Judaic Studies from the Lander Institute in Jerusalem and a doctorate in Jewish History from Bar-Ilan University, completed in 2016. His dissertation was entitled: Rabbinic and Maskilic Encounters with Zoology in the Nineteenth Century. Slifkin explores traditional rabbinic perspectives in his books and discusses how they may relate to issues of interest to modern science. Slifkin is the author of numerous books dealing with the Torah, science and zoology. In Slifkin's approach to the reconciliation of Genesis and modern scientific theory, traditional Judaism mandates neither a literalistic approach to Biblical cosmology, nor a belief that the Talmud is always correct about scientific matters. Views similar to these were accepted by some as within the realm of Orthodox Judaism. A public debate began about Slifkin's books about the question of how literally Orthodox Judaism interprets the Torah and how much weight should be given to the scientific discussions of rabbinic sages. Slifkin's books, which had "cautious references to evolutionary theory", led to a denunciation of his work by ultra-Orthodox authorities. The ban sparked a debate, largely on the Internet which led to Slifkin's publisher, Targum Press discontinuing distribution of his books. Yashar Books, a smaller Jewish publisher, agreed to distribute them. 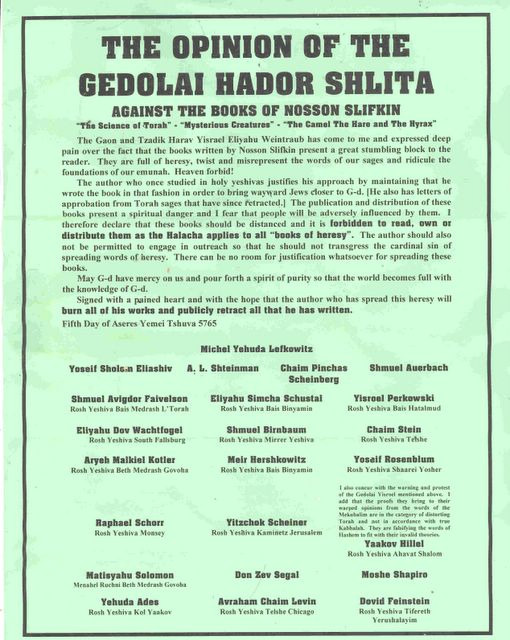 Rabbi Aharon Feldman and Rabbi Shlomo Miller wrote articles in defense of the ban, and Rabbi Moshe Meiselman gave three lectures on this topic at Toras Moshe, although Rabbi Feldman grants that, even in the opinion of Rabbi Eliashiv, Slifkin "cannot be called a heretic" even though parts of the books are, in their view, heretical, because "he did follow, at least, a minority opinion." These defenses of the ban were themselves controversial, and Rabbi Slifkin posted them all on his website, together with rebuttals written by various people. Rabbi Meiselman requested that Rabbi Slifkin remove the lectures from his website, a request to which Slifkin did not acquiesce. In 2013, Rabbi Meiselman released a nearly 900 page book entitled "Torah, Chazal, and Science", which he stated "was in response to some recent controversies surrounding issues of Torah and science. A spate of books... have attempted to introduce a radical new theology and proclaim it compatible with classic Jewish belief." On 5 October 2008 Slifkin published an essay entitled In Defense of My Opponents in which he acknowledges that there is a reasonable basis for a ban on his books in certain communities. The Camel, the Hare and the Hyrax: A Study of the Laws of Animals with One Kosher Sign in Light of Modern Zoology (Targum Press 2004) ISBN 1-56871-312-6. Republished with corrections in 2011. Nature's Song: An Elucidation of Perek Shirah, the Ancient Text that Lists the Philosophical and Ethical Lessons of the Natural World (Targum Press 2001) ISBN 1-56871-274-X. Republished in 2009. Slifkin has a website called "Zoo Torah" and writes a blog called "Rationalist Judaism," in which he promulgates his opinions on Jewish thought. He has also published e-books on many of his topics of interest. ^ Lesher, Michael (2014). Sexual Abuse, Shonda and Concealment in Orthodox Jewish Communities. McFarland. pp. 136–14. ISBN 9780786471256. ^ "The Opinion of the Gedolai Hador Shlita". Zootorah.com. Retrieved 2015-04-30. ^ Rothenberg, Jennie (October 2005). "The Heresy of Nosson Slifkin". Moment Magazine. Archived from the original on 2009-11-29. ^ Rabbi Aharon Feldman. "THE SLIFKIN AFFAIR – ISSUES AND PERSPECTIVES" (Doc). Zootorah.org. Retrieved 2015-04-30. ^ "Controversy". Zootorah.com. Retrieved 2015-04-30. ^ Meiselman, Moshe (2013). Torah, Chazal, and Science. Israel Bookshop. p. xvii. ISBN 978-1-60091-243-6. ^ Slifkin, Natan (October 5, 2008). "In Defense of My Opponents" (PDF). Zootorah.com. Retrieved 2015-04-30. ^ "Books". Zootorah.com. Retrieved 2015-04-30. ^ [zootorah.com "Zoo Torah site"] Check |url= value (help). ^ "Rationalist Judaism". www.rationalistjudaism.com. Retrieved 2017-08-15.